Grand Valley State University has been my home for the past four years. There have been so many great opportunities, friendships, learning experiences, and more! However, no home is perfect. GVSU has many issues that need to be addressed: low state funding, student safety concerns, inclusion and diversity on campus, and any new issues that arise each year. Any good home owner doesn’t just ignore the problems, but they would rather roll up their sleeves and gets right to work. This is what student senate is all about - listening to student concerns and taking an active role in making our home the best it can be. There are 44 student senate positions available for during elections for the next academic year (six reserved for incoming students). We want the best and the brightest students to represent the 25,000 Lakers we work to serve through a variety of projects. These tasks and projects can be worked on through the seven different committees such as senate resources, finance, campus affairs, educational affairs, diversity affairs, external relations, and public relations. If elected, a senator will sit on these committees and work with some of the most talented leaders across campus to better our university. 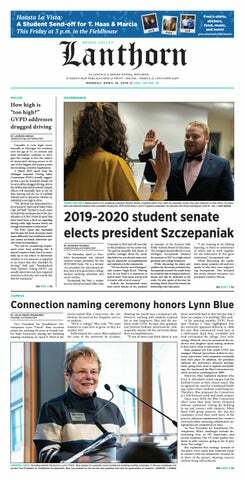 While the senators this past academic year have put in a lot of time and effort into different tasks and have accomplished a lot, their time on student senate will soon end. We are looking for a new batch of leaders to take their place and keep moving the campus forward by representing our students. This upcoming year I personally have set a goal to see senate break all our election records and have the most students run and the most students vote than any year before. This is not an easy task, but many hands make light work and that’s why we need everyone’s support! It’s important that good student leaders are encouraged to be a part of student senate because they can share the student voice and perspective with GVSU administration. If you’re not interested in running for student senate, that’s okay! You can still participate in this election by seeking more information about those running, or voting for the 10 candidates you have faith in! It is our duty to protect our University and make sure we pick the best possible leaders to represent all Lakers and make GVSU even better in the upcoming year. You can get more information on elections by going to gvsu.edu/studentsenate on how to run and vote. Election packets are due in the Senate Office Monday, March 20th and elections take place online from Monday, March 27 through Saturday, April 1, 2017.